Jukebox musicals are proliferating so quickly on Broadway that it’s hard to keep up. It’s also difficult to decide how to rate them: because the songs are already good? Or the show incorporates the music well? Or the overall design doesn’t insult one’s intelligence? Well, it may have its faults—especially playwright Dominique Morrisseau’s by-the-numbers book—but Ain’t Too Proud: The Life and Times of the Temptations, is a qualified success. The group’s story is told through the eyes (and narration) of Otis Williams, the band’s leader, as we see him growing up in hardscrabble Detroit and how music became his sole salvation (along with so many other young men). Ain’t Too Proud plots a familiar trajectory—local popularity, then discovery by Motown impresario Clive Davis, followed by popular success, personal animosities, breakdowns, breakups, tragedies, reunions, and a final legacy—but it still motors along entertainingly. It works for several reasons. 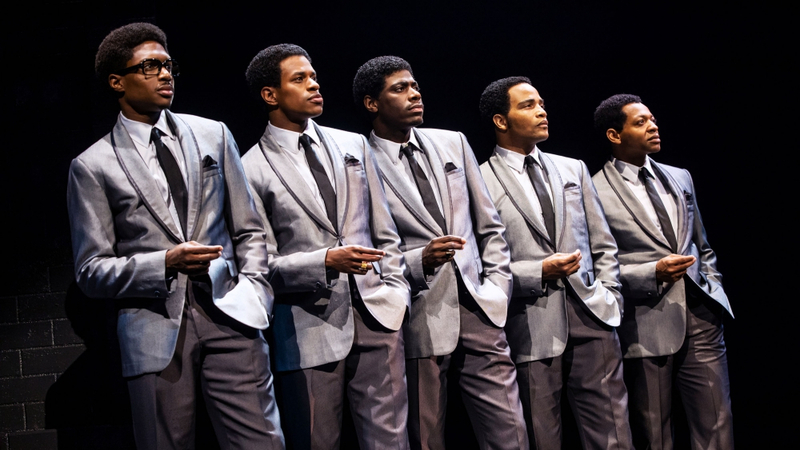 Sergio Trujillo’s often ingenious choreography takes the archetypal Temptations stage moves from their TV and concert appearances and multiplies them winningly throughout the show. Des McAnuff’s direction, snappy and slick without becoming superficial, keeps it all moving briskly whenever well-worn tropes rear their heads. And the tunes themselves are a virtual compendium of the best of Motown, from the group’s number-one singles like “My Girl” and “Just My Imagination” to darker—but still hugely popular—hits like “Papa Was a Rolling Stone,” the latter a highlight of the show with its pointed commentary on an era swirling around Vietnam and other societal ills. The first-rate cast sings with freshness and a keen respect for the originals yet makes these soul standards their very own. Derrick Baskin’s Otis is a perfectly brooding narrator; other standouts are the troubled but charismatic David Ruffin of Ephraim Sykes and Eddie Kendricks of Jeremy Pope. Ain’t Too Proud is a jukebox musical no one would be embarrassed to attend.